(Nanowerk News) A team of scientists from the University of California, Los Angeles (UCLA) and Northwestern University has produced 3-D images and videos of a tiny platinum nanoparticle at atomic resolution that reveal new details of defects in nanomaterials that have not been seen before. Prior to this work, scientists only had flat, two-dimensional images with which to view the arrangement of atoms. The new imaging methodology developed at UCLA and Northwestern will enable researchers to learn more about a material and its properties by viewing atoms from different angles and seeing how they are arranged in three dimensions. The study will be published March 27 by the journal Nature ("Three-dimensional imaging of dislocations in a nanoparticle at atomic resolution"). The authors describe being able to see how the atoms of a platinum nanoparticle -- only 10 namometers in diameter -- are arranged in three dimensions. They also identify how the atoms are arranged around defects in the platinum nanoparticle. Similar to how CT scans of the brain and body are done in a hospital, the scientists took images of a platinum nanoparticle from many different directions and then pieced the images together using a new method that improved the quality of the images. This novel method is a combination of three techniques: scanning transmission electron microscopy, equally sloped tomography (EST) and three-dimensional Fourier filtering. Compared to conventional CT, the combined method produces much higher quality 3-D images and allows the direct visualization of atoms inside the platinum nanoparticle in three dimensions. "Visualizing the arrangement of atoms in materials has played an important role in the evolution of modern science and technology," said Jianwei (John) Miao, who led the work. He is a professor of physics and astronomy at UCLA and a researcher with the California NanoSystems Institute at UCLA. 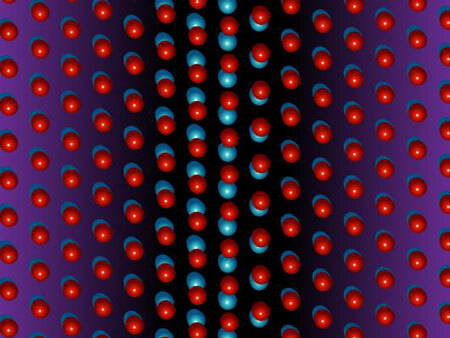 "Our method allows the 3-D imaging of the local structures in materials at atomic resolution, and it is expected to find application in materials sciences, nanoscience, solid state physics and chemistry," he said. "It turns out that there are details we can only see when we can look at materials in three dimensions," said co-author Laurence D. Marks, a professor of materials science and engineering at Northwestern's McCormick School of Engineering and Applied Science. "We have had suspicions for a long time that there was more going on than we could see from the flat images we had," Marks said. "This work is the first demonstration that this is true at the atomic scale." Nanotechnology expert Pulickel M. Ajayan, the Benjamin M. and Mary Greenwood Anderson Professor of Engineering at Rice University complimented the research. "This is the first instance where the three-dimensional structure of dislocations in nanoparticles has been directly revealed at atomic resolution," Ajayan said. "The elegant work demonstrates the power of electron tomography and leads to possibilities of directly correlating the structure of nanoparticles to properties, all in full 3-D view." Defects can influence many properties of materials, and a technique for visualizing these structures at atomic resolution could lead to new insights beneficial to researchers in a wide range of fields. "Much of what we know about how materials work, whether it is a catalyst in an automobile exhaust system or the display on a smartphone, has come from electron microscope images of how the atoms are arranged," Marks said. "This new imaging method will open up the atomic world of nanoparticles."